This is a simple and healthy salad..just perfect for a light lunch along with a bowl of soup or a sandwich ! 1. Pour oil in a pan and saute the garlic. 2. Add finely chopped spinach and stir fry for half a minute. 4. Season it with black pepper, salt and lemon juice. Note: It tastes just perfect with this simple seasoning...however you may add roasted &; crushed cumin, chaat masala...if you like. Very healthy salad, love it. Never had a chance to taste this salad,sounds truly wonderful. I have bookmarked it for my tomorrow's dinner. 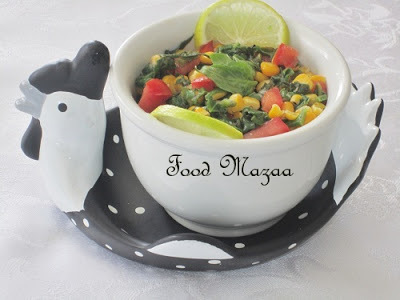 What a lovely, colourful and delicious side dish! I like all the wonderful wholesome ingredients. Thank you for sharing your Corn and Spinach salad with the Hearth and Soul hop. 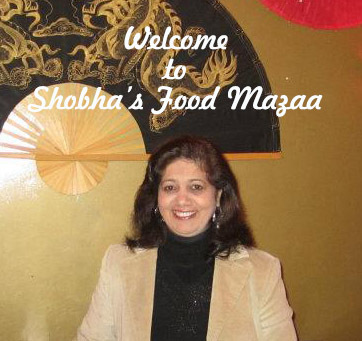 Delicious salad Shoba, Thanks for sharing with Hearth and Soul blog hop.